When you give a car as a gift, you have to make sure that the recipient is going to love it. Make sure you know what kind of car that person wants, or you may find yourself taking it back. The recipient may return it even if she doesn’t have a vehicle if she doesn’t like it. You may have some ideas about what car she needs, but make sure that you buy what she wants even if it doesn’t jive with what you want for her. Make sure that you get a car that has a good return policy and a reasonable warranty if you are going to buy a used vehicle. You may even want to get an extended warranty on it and then transfer the warranty to the recipient when you give her the car. You don’t want this person angry at you for giving her a lemon, so make sure you’re extra careful when you inspect the vehicle for damages, defects and so on. 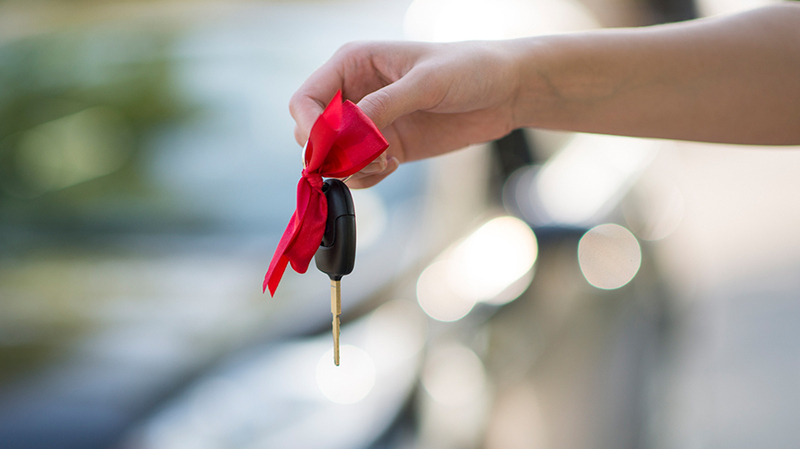 The first thing you need to remember is that you have to register and insure the vehicle if you plan to take it off the lot and take it to where you can give it as a gift. You can register everything in your name to start and just claim ownership of it until it’s time to give it as a gift. That way, it’s legal, and it’s ready for your friend to jump into it and drive the moment you let that person know about the gift. yourself to the gift recipient. That procedure just takes a few minutes and a few signatures. The recipient will then take the information that you provided with her to the Department of Motor Vehicles to get a new title and registration in her name. She will have to provide proof of new insurance coverage to do so. When you change ownership of the vehicle, you’ll want to make sure that you complete the paperwork in the appropriate manner. You will need to put a price on the title for the amount for which you sold the vehicle to the person. Since it’s a gift, it’s free. You can put $0 or the word “gift” to express that the car was a gift. That way, the person does not have to pay any taxes on a sale that was not really a sale but a simple act of transfer. The recipient won’t get any strange surprises at the DMV. If these tips don’t sound too complicated, and you still want to give someone a car as a gift, you should go for it. Look for something that your loved one adores and get a package on it that will make it unique for that person. She will love you for being so thoughtful as to give such a practical gift.